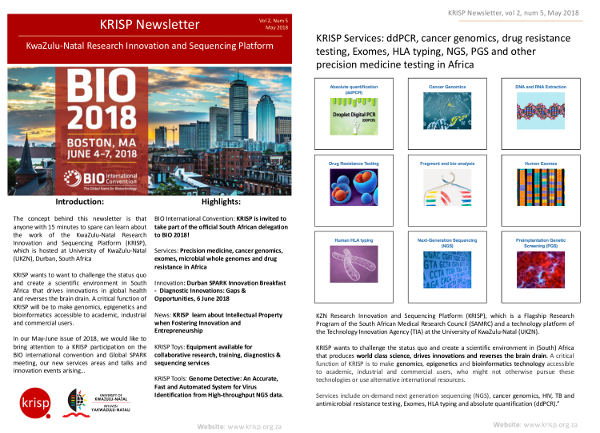 KRISP on the official South African delegation of the BIO international convention in Boston, Global SPARK meeting, new services and online quote section of website, genome detective, inovation breakfast and talks. We hope you enjoy it and find it informative. We welcome any feedback about content or format. KRISP wants to want to challenge the status quo and create a scientific environment in South Africa that drives innovations in global health and reverses the brain drain. A critical function of KRISP will be to make genomics, epigenetics and bioinformatics accessible to academic, industrial and commercial users.